Tuscany can boast fairs and typical exhibitions in all seasons, every Tuscan small town will make your holidays merrier with all kinds of typical events – all of them occasions for food and wine tasting or buying typical goods and artisan souvenirs at the stalls, and listening to music. There are, however, also some events that are renowned even abroad, and especially appreciated for their particular beauty – if you are in Tuscany at the right time, you just cannot miss them. The city of the leaning tower celebrates its patron saint, San Ranieri, during the whole month of June. It is a month of events and historical commemorations, with exhibitions, concerts, festivals and feasts in the squares – all or almost all about Pisa’s glorious traditions in the past. On the Patron’s day, June 17, the historical regatta takes place: four boats, one for each quarter of the town, challenge one another on the waters of the Arno river. To win, a team must not just reach the finishing line first, but the team’s “montatore” must climb a ten-meters high flagpole set near the finishing line and grab the blue “palio”, a drape which is the symbol of victory. On the last Saturday of June, the “Gioco del Ponte” takes place. It consists of two main events. First, the great parade of the historical show with more of 700 people in ancient costumes – and then the “battle” on the Ponte di Mezzo (Midway Bridge, in the historical centre), between the two historical teams of the city, Mezzogiorno e Tramontana, representing the southern and northern part of town respectively. The winning team must succeed in pushing the enemies’ truck all the way down the sliding rail set on the bridge to the other bank, thus achieving complete control of the bridge itself. The people of Pisa are all great fans of one or the other of the two teams, and the excitement is great, much as in football. During the whole month of June Pisa is well worth a visit, for it is in all its splendour. But on one night in June the whole city really becomes a sort of wonder. On the evening of June 16 all electric lights in town go out. Pisa is illuminated only by a myriad of flickering little lights from candles that twinkle in small glasses. The glasses are set to decorate all the facades and windows of houses and palazzi and towers, especially along the Lungarni, and the sight is really impressive. The atmosphere is romantic. 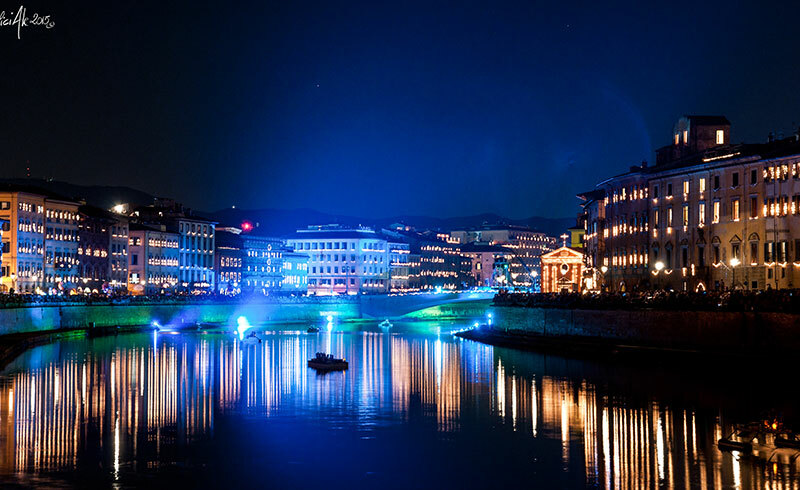 Flickering little lights are also set on the running waters of the Arno, and all the reflected lights add to the enchanting atmosphere. The celebrations end with a great fireworks show over all the Lungarni, so that, wherever you are in town, you’ll be able to enjoy this feast of lights and reflexes that will surprise you and bring you back in time. If you are in Tuscany in June, a visit to Pisa must be in your agenda! 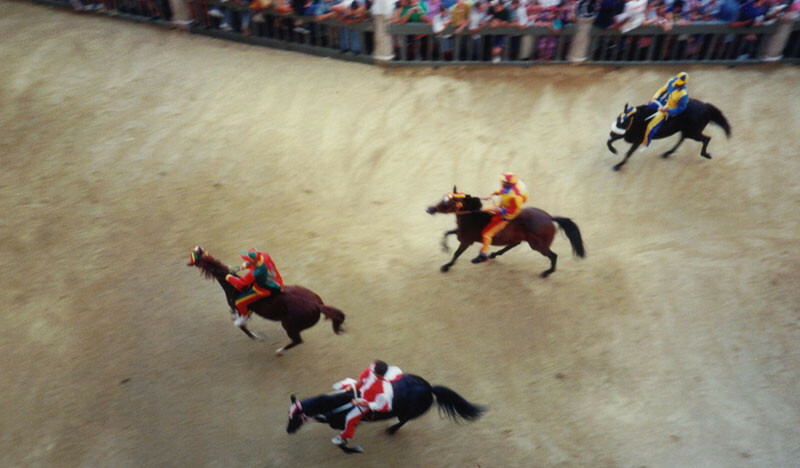 The Palio is not an invention for tourists and visitors. It is a great feast that is an essential part of the civil life of Siena without interruption at least since 1644. 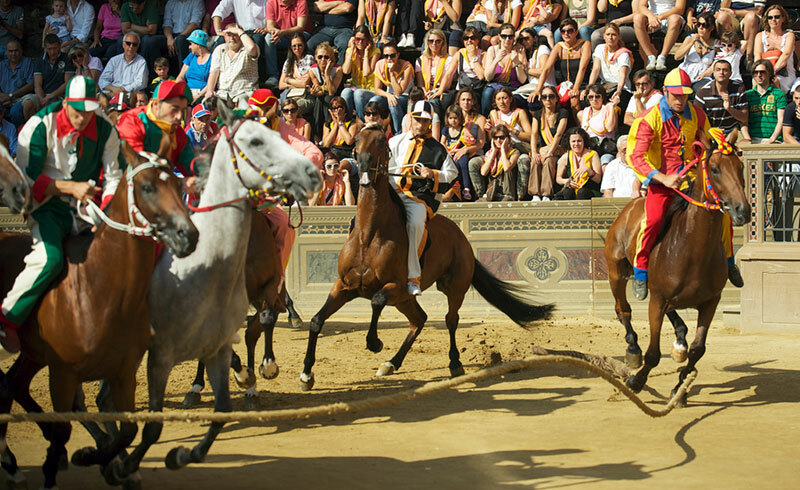 As a matter of fact, the Palio is a horse race, in which the seventeen Contradas (quarters) of town challenge each other twice a year in the magical setting of Piazza del Campo, a splendid medieval square. 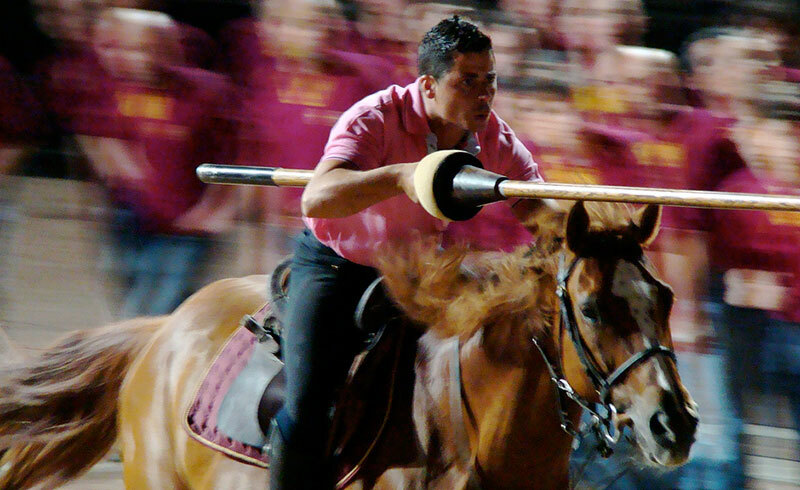 But in itself the Palio is sheer, raw emotions on the loose. Being in the Campo together with the Contrabass’ fans (the “contradaioli”) will be a unique experience, their enthusiasm, anxiety and emotivity will move you too, and you’ll forget soon that you are visitors from abroad. In the end, you’ll also feel part of this city and its passions, which are particularly alive in the days preceding the races. You’ll find yourself inciting and then praising the winning Contrada as if it were your own – and the traditions of Siena were also your own traditions. Only ten of the Contrabass run in each Palio. The complex mechanics of the race seems to be conceived with the purpose of having emotions and anxiety rise both in the runners and in the audience. It reaches its peak, after a usually longish time of waiting, in the so-called “mossa”, that is the moment in which, before the start, the horses and their jockeys must all fall into line between two taut hawsers, the “canapi”. The order of entry is established by lot, the tenth, and last, Contrada to enter into line will have to do so, on the contrary, “di rincorsa”, that is by taking a run-up – when and how is up to its jockey, who thus decides when the race actually starts, as the hawers lower down. The race itself consists of three laps of the square, for about 1000 ms., and the glory of victory is only for the first one that reaches the finishing line: no second prizes are awarded. But the true winner is the horse, that can win for the Contrada even if it arrives “scosso”, that is without the jockey. Rejoicings begin soon. Starting from this moment, the winning Contrada will go on reminding the whole city, at every possible occasion, that it won on the Campo. It all culminates between September and October, when in the Contrada or quarter of town, all decked up for the feast, the “victory’s dinner” will take place. Thousands of “contradaioli” participate, but the guest of honour is the winning horse, the well-praised hero of the feast. Entrance and participation to the palio are completely free, you just have to enter the square before the historical celebrations in costume in the afternoon, before the evening race. Folklore and unforgettable emotions are also free. If you think that autumn isn’t the right period to visit Tuscany and its small towns, this incredible event will make you change your mind: three days wholly dedicated to comics and manga, to table games and role-playing games, to fantasy imagery, and cartoons. It’s the Lucca Comics and Games, the greatest comics event and exhibition in Italy, and one of the biggest in Europe, drawing more than half a million people over three days. Every year, between October 29 and November 1, Lucca seems to change its face completely. From an elegant and restrained small town, it turns into a fantastic, imaginary town made lively and chaotic by thousands of cinephiles and comics fans hunting for the latest news, cosplayers ready to show their latest creations, video games fans who want to try new products, serial fanatics, and, in general, all sort of people with a passion for one or the other pop subculture. 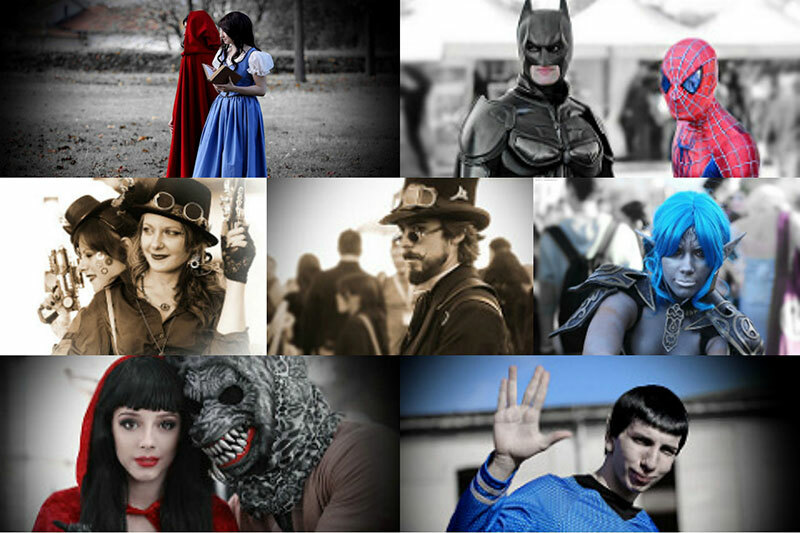 But Lucca Comics and Games is not just for diehard fans. It is a great emotion for anyone to walk in the streets of the pleasant small town crowded with the characters from comics, manga and cartoons. It’s like going back to one’s childhood. And it’s a really unique event to make your holiday in Tuscany very special, and unforgettable. If you think that February is not holiday time, Tuscany will surprise you from this point of view too. February is carnival time, and this feast in Viareggio is famous among carnival fans world-wide. Since 1837 the small, beautiful city of Viareggio, by the Tyrrhenian sea, entertains its visitors for the whole month with a series of merry and amazing exhibitions, and other carnival events. 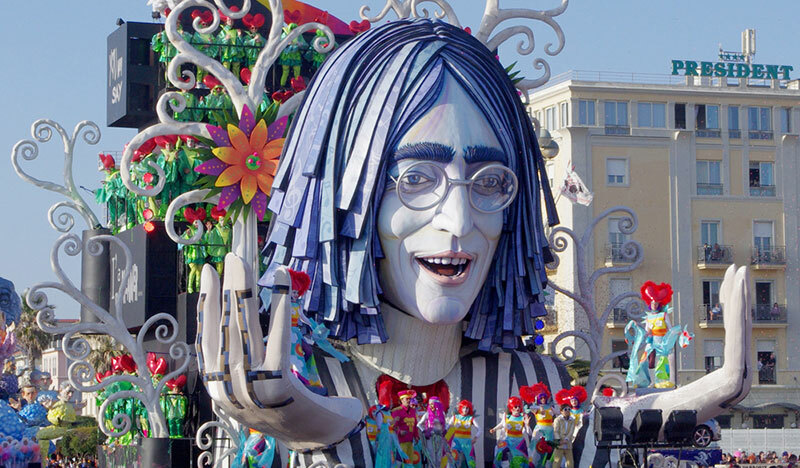 In time, the carnival, papier-mâché wagons in Viareggio have changed their shapes and functioning, so that now they are mechanically animated and are of even larger size than before. The papier-mâché wagons are by now really impressive and imposing. Every waggon moves according to the rhythm of dancers and music, and they represent an amusing satirization of Italian and international politics, as well as of everyday contemporary life. They parade along the promenade, followed by a huge enthusiastic crowd. You can put on a mask or costume yourself, as many people in Viareggio do during this time, and be an active part of the celebrations, or just watch the show. Twice a year you’ll be able to let yourself get deep into medieval times thanks to the historical evocation of the Giostra del Saracino (the Saracen’s contest) in the Tuscan small town of Arezzo. The Giostra is an ancient combat game that was popular in Arezzo already in the middle ages. It was abandoned for centuries, but brought again to life after the world wars. It takes place twice a year, in a night version on the second-last Saturday of June, and in a day version on the first Sunday of September, but for the people of Arezzo the contest begins long before, with the draw of the order of the participating contradas (or quarters), that will challenge the “King of Indies” on horseback with their spears, in the course of various kinds of symbolic fighting. And with the propitiatory dinners taking place in many streets of the town, and to which you might be invited. The beginning of each combat day is very medieval in style, it is inaugurated by a mortar shot at 7 a.m., and more shots will accompany the whole day and its events. A large procession will then parade through the town with hundreds of extras in historical costumes and on horseback, among the constant blare of trumpets and the thunder of drums and the fluttering of coloured flags – a complex show that is sure to impress you and make you feel new emotions, and the echo of remote times. The whole ceremonial is perfectly timed and organised, and in the end the combat is won by the contrada that, with its horseman, will strike the “King of Indies” in the more effective ways, reaching the higher score.